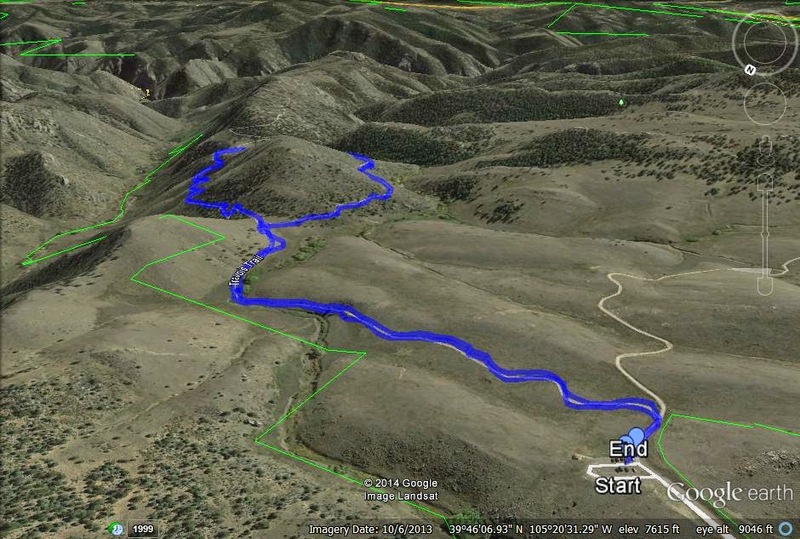 Directions: The Travois trail starts from the Camino Perdido Trailhead, aka, the northern TH for Centennial Cone Park. From Denver/Boulder and Hwy 93 head west on Golden Gate Canyon Road toward Golden Gate Canyon State Park. Make a left on Robinson Hill Road and a left on Camino Perdido Road to the Park entrance. Centennial Cone Park has a trail system that consists of a 12 mile loop through rolling hills, meadows, and pine forest. There are 2 shorter day hikes, the Mayhem Gulch trail on the South-west portion of the park and the Travois >Evening Sun Loop on the Northeast portion. The park alternates between hiking use and biking use on weekends so check the park's website before heading out (the link is provided below). The Travois trail descends from the parking lot through rolling hills. Keep left at the trail junction with the Evening Sun trail to stay on the Travois Trail. The next part of the trail skirts the side of a deep canyon before it ascends to a pass and the 2nd junction with the Evening Sun trail. From this point you can take the Evening Sun trail back up to the Travois trail or continue on the Travois trail for as long as you like.